IT was in the fall of 1895 that I first saw him, sitting with his back to the light in Mrs. Leggett's sitting room in Paris. I did not catch his name, but presently found myself next to him, and being asked if I spoke French. He said he didn't either; when I asked him if in his opinion English would be the next dominant language of the world — as they seemed to be the coming race — "The next great leading force on the earth will be the Tartars or the Negroes" — was his astonishing reply; and he proceeded to give his reasons. I found that he dealt not with decades or even centuries but with vast ages and movements of races, as judged by his knowledge of the past. 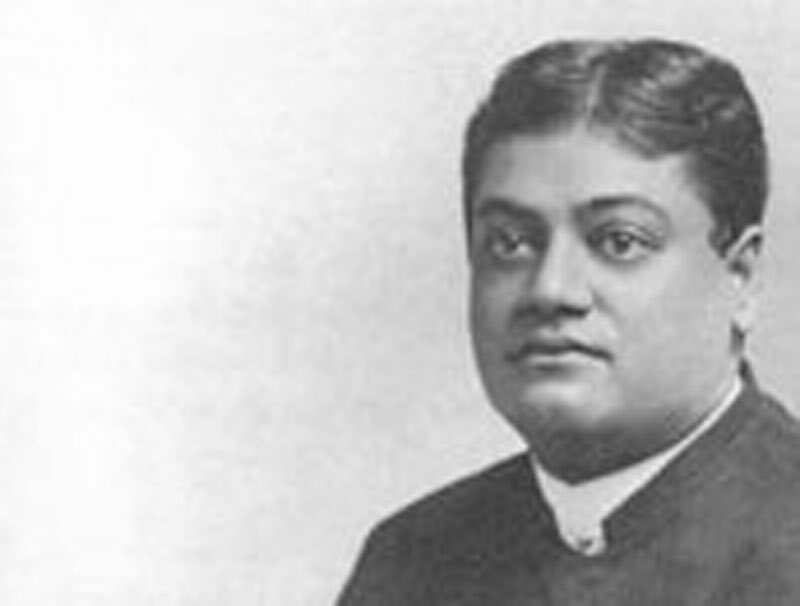 Then I inquired who this deep-voiced man was, and was told he was a holy man from the East, Swami Vivekananda. It was long after this that the flower of the Italian army was destroyed utterly by the Negroes of Abyssinia, and I recalled the prophecy that sounded so unlikely! Besides this wonderful guest were three others, one of them the young Boston woman who had taken the prize for the "Hymn of the Republic" sung at the World's Fair. She was little and sat very erect, with an alert expression. Swami was rolling out Sanskrit and translating the ancient glories of India, nobody daring to speak. He dwelt finally upon the spiritual superiority of the Hindu, even today. Thereupon the Boston lady interrupted: "But, Swami, you must admit that the common people of India are way below the cultivation of the same class in, say Massachusetts; why look at one item — the newspapers!" Swami, recalled from his poetic flight, raised his great eyes and regarded her silently. "Yes, Boston is a very civilized place," he said. "I landed there once, a stranger in a strange land. My coat was like this red one and I wore a turban. I was proceeding up a street in the busy part of the town when I became aware that I was followed by a great number of men and boys. I hastened my pace and they did too. Then something struck my shoulder and I began to run, dashing around a corner, and up a dark passage, just before the mob in full pursuit, swept past — and I was safe! Yes," he concluded, "Massachusetts is a very civilized place!" Even this did not silence the little woman, and with astonishing temerity she raised her voice again to say, "But, Swami, no doubt a Bostonian in Calcutta would have created just such a scene!" "That would be impossible," he replied, "for with us it is unpardonable to show even polite curiosity to the stranger within our gates, and never open hostility." Then we all went back together, and the days that followed! The air of freedom seemed to do him good — and such talks, such wonderful sermons! With his flame-coloured robes draped about him, what a figure he was as he strode the lawns of Ridgely! His stride came nearer to the poet's description of a "step that spurned the earth" than anything I ever expect to see again; and there was a compelling majesty in his presence and carriage that could not be imitated or described. One day he told me that he wanted to undertake some sort of work that would keep his hands busy and prevent him from thinking of things that fretted him at that time — and would I give him drawing lessons? So materials were produced, and at an appointed hour he came, promptly, bringing to me, with a curious little air of submission, a huge red apple, which he laid in my hands, bowing gravely. I asked him the significance of this gift, and he said, "in token that the lessons may be fruitful" — and such a pupil as he proved to be! Once only did I have to tell him anything; his memory and concentration were marvellous, and his drawings strangely perfect and intelligent for a beginner. By the time he had taken his fourth lesson, he felt quite equal to a portrait; so... Turiyanananda posed, like any bronze image, and was drawn capitally — all in the study of Mr. Leggett, with its divan for our seat, and its fine light to aid us. Many great ones may come to that room in its future years, and probably will, but never again that childlike man, toiling over his crayons, with as single a mind and heart as if that were his vocation. How often he thanked me for the pleasure it gave him, and for the joy of learning, even that! For the neck of thy beloved! I could learn the words, but the air was quite beyond me, so full of little half-tones, and curious runs and turns. "You never can hide your heart behind those eyes," he told me once. "for they speak before your lips." And then he added, "Don't try to. Keep the shell of pretence that everybody goes encased in off yourself; don't let it form. You will suffer, but you will feel more and do better work. Nearly all the world goes in a thick casing of convention and hypocrisy — like the two men in the fable, greeting each other with cheek pressed to cheek, each looking over the other's shoulder, meanwhile winking at the rest of the world." One of the greatest things about Swami was his human side. Like a big lovable boy, he thoroughly enjoyed the things he liked: ice cream, for example. How many times I have seen him rise from the table after salad, excusing himself to smoke or walk, when a very quick word from Lady Betty (Mrs. Francis H. Leggett) that she believed there was to be ice cream would turn him back instantly, and he would sink into his place with a smile of expectancy and pure delight seldom seen on the face of anybody over sixteen. He just loved it, and he had all he wanted too. While I was there that aunimn, I had a worriment that bothered me a good deal, and though I said nothing of it to anyone, it was constantly in my thoughts. Late one afternoon Swami asked me to take a little walk to see a threshing machine at work in a barnyard visible from the west windows of Ridgely. I had been staying in the village for a week, coming every day to the Manor House, and sharing in all its dear delights. All at once, as we went down the hill, he said, "Where were you last night? We missed you at the Ridgely party." I was perfectly amazed but managed to say I had not heard of it. "Wonderful affair," he continued, "stringed instruments and such a supper! Pheasants'" he added. "Ever taste pheasant?" "No," I faltered, "tell me who was there." "Oh everybody," he said, "and they danced and danced, not at the Casino but in the house, everything moved out. Wonderful party!" Why I had not been asked and what it all meant, how they could have managed not to speak of it to me before or after! Well, I gave it up, and did not learn until the next day that it was fable, told to change my line of thought and lift me out of the worry for a little while. And nothing could have been more convincing than his manner. I can see him now, lying at full length on the green couch in the hall, sound asleep like a tired child. Once I tried to draw his features thus, in absolute repose; the lines of the mouth were so simple and lovely and yet so very difficult! Once he asked me at the end of the drawing lessons, what he could do for me. And having heard that he was wonderful at reading the future, I begged him to do it for me. So he said he would when he felt "prophetic". A few days after he said, "Come!" and led the way to the library. We sat on the green divan, and asking me to open my hand flat, he laid his hand lightly upon it and turned his head away. He was absolutely silent and as nearly everyone had gone off to walk or read, I hoped for an uninterrupted reading. He took a deep breath or two and began to speak, "I see..." when the door burst open and Alberta in her riding habit descended upon us and broke the spell. He never took it up again and I left shortly after. Another time there were several lady guests, two of them were accompanied by daughters. We were in the hall, after dinner, and he was draped in his flame-coloured silks. Oh, how splendid a figure, enthralling to the heart and imagination. As he sat by the fire, his eyes slowly turned from one to the other, heavy, dark, liquid eyes, like the "thick clustering bees" in the Eastern simile. All at once he began to speak on marriage, and from the first word the depth of his great meaning was apparent. He spoke as I have never heard a man speak to women. "Of the space that makes attraction felt" in that great bond; and while it seemed to cause some alarm at first to the two mothers, the dignity and nobility of his presentation soon enthralled them too. We shall none of us hear its like again. His views were those of a perfectly normal and natural being with a spiritual nature equal to the other. The words that he said were like a song, impossible to repeat, but of so clear a meaning that they were the very stuff of life itself. When he had finished he arose and amid perfect stillness took his departure; the ideal of a holy man.